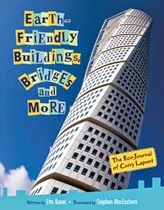 Not every page of Earth-friendly Buildings, Bridges and More by Etta Kaner with illustrations by Stephen MacEachern contains Earth-friendly content. Nonetheless, this is quite a marvelous book about the work that goes into building a variety of structures and how many of them are being built greener. While there is certainly content related to large buildings being made more green, there's also material about designing buildings to withstand earthquakes and storms. It's as if technology is working with Earth, not against it. It gives readers a good idea of the number of people, the variety of engineers, for instance, necessary just for the planning of a big construction project. This is important because it helps to explain why building takes so long and is so expensive. Technology has had a bad rap for many years now. The 1950's were filled with movies about science gone amock. I've read that The China Syndrome was a turning point in how science was perceived by the public in the '70s, that technology would lead to very bad things. First some guy is messing around with creating life, and the next thing you know, dinosaurs are coming back and eating people. But in Earth-friendly Buildings, Bridges and More, technology is portrayed as a good thing. Mom, Dad, an uncle, and a cousin are all engineers, all involved in creating or fixing things. Even if you're not a fan of tech, this is different. The stereotype about environmental living involves natural fibers, whole grains, and funny light bulbs. But it takes technology to make real environmental progress, to find ways to heat and cool enormous buildings, for instance. Earth-friendly Buildings, Bridges and More can help young people recognize that. You are correct that this book points out that it takes a team of different design professionals to make a large development project happen. It was nice to see civil engineers acknowledged. However, the one thing it only superficially addressed is the massive layers of regulatory oversight (with it's corresponding time and monetary implications) that is part of today's development process. Most people have no idea of the number of permits and approvals required for even small simple projects. I suspect that regulation was outside the "scope of service" of this book. It would be hard to fit it into the premise of a child's scrapbook, though certainly all the engineers in her family would be aware of it. Additionally, this is a Canadian author, and she was writing about buildings and bridges all over the world. She would have had to address regulation in a very general way because it would have been different in different places. I'm trying to imagine a children's book about regulatory oversight. There's a real possibility I'll start obsessing about this.